We are Karnataka Shops and Establishment Registration in Raichur. The Karnataka Shops and Establishment Act regulates the operations of shops and commercial establishments. The Karnataka Shops and Establishment Act was introduced to regulate the hours of work, annual leave with wages, wages and compensation, employment of women and children and other aspects of a shops or commercial establishment. 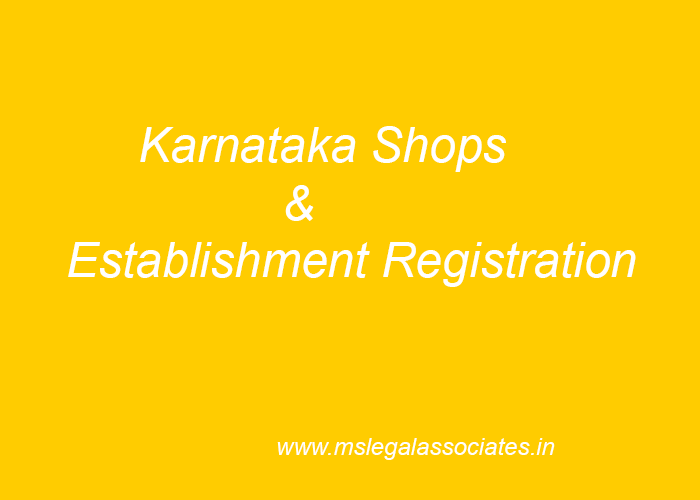 Who has to register under Karnataka Shops and Commercial Establishment Act, 1961. Entrepreneurs owning shops and commercial establishments in the State of Karnataka have to compulsorily register with Department of Labour, Government of Karnataka as per the Karnataka Shops and Commercial Establishment Act, 1961. - A factory or a shop/establishment attached to a factory are covered under Factories Act and hence no registration under shops act is required to be done. 11. Persons directly engaged in preparatory or complementary work, such as, clearing and forwarding clerks responsible for the despatch of goods. - Each owner, within 30 days from starting the business shall submit application form in form 'A' to register his establishment. - Registration certificate must be displayed on visible place inside the office premises. - Registration certificate is valid for 4 years period. Before the expiry of the period, renewal application to be submitted for the next period. - It shall be the duty of an employer to notify to the registration authority, in the prescribed form, any change with respect to any information contained in his statement during registration/renewal within 15 days after the change. Ex. Change in address, change in ownership, change in number of employee etc. - After closing the business of his establishment, should surrender the registration certificate to the registration authority. The Karnataka Shops and Establishment Act prohibits the employment of child at any establishment. A child is any person who has not completed fourteen years of age. Also, young person and woman cannot be required or allowed to work whether as an employee or otherwise in any establishment during night. A young person is anyone who has completed the age of fourteen, but not eighteen. As per the Karnataka Shops and Establishment Act, employees can only work for nine hours on any day and forty-eight hours in any week. If the employee works more hours, then wages need to be provided for overtime. Further, the period of work of an employee in an establishment should be fixed so that, no period or work exceeds five hours without an interval. All establishments in Karnataka are required to remain close for one day of the week and every employee in an establishment must be given atleast one whole day in a week as a holiday for rest. However, if the establishment has sufficient additional staff, then it can remain open throughout the week. Employees working in an establishment in Karnataka should be allowed to avail a leave with wages at the rate of one day for every twenty days of work performed. In case, of young persons, the employee should be allowed to avail a leave with wages at the rate of one day for every fifteen day of work performed.